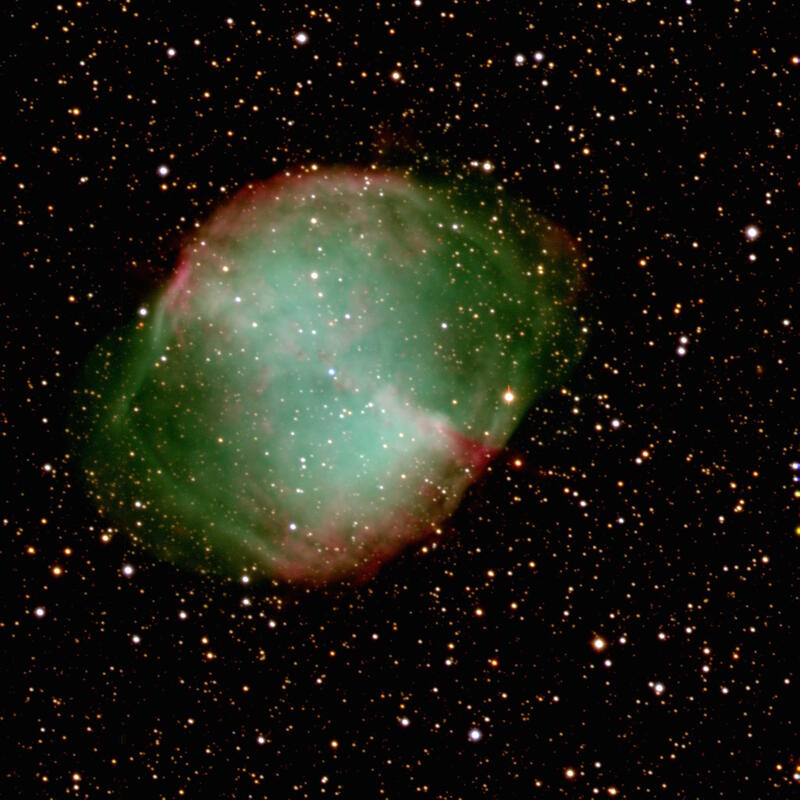 The planetary nebula Messier 27 (NGC 6853) in Vulpecula, shown from a 120-second red-light exposure (in twilight) with a Tektronix 2048x2048 CCD at the prime focus of the 4-meter Mayall telescope of Kitt Peak National Observatory. North is at the top and east to the left, for direct comparison with a chart or eyepiece view. The image has been block-averaged to 512x512 for this presentation, which uses a logarithmic intensity transformation to preserve information across a wide dynamic range. The field is 14.3 arcminutes square. Please pardon the vertical saturation streaks from bright stars in the field; these become almost impossible to avoid in rich Milky Way fields (and at long exposures, anywhere in the sky) with large-format CCDs. 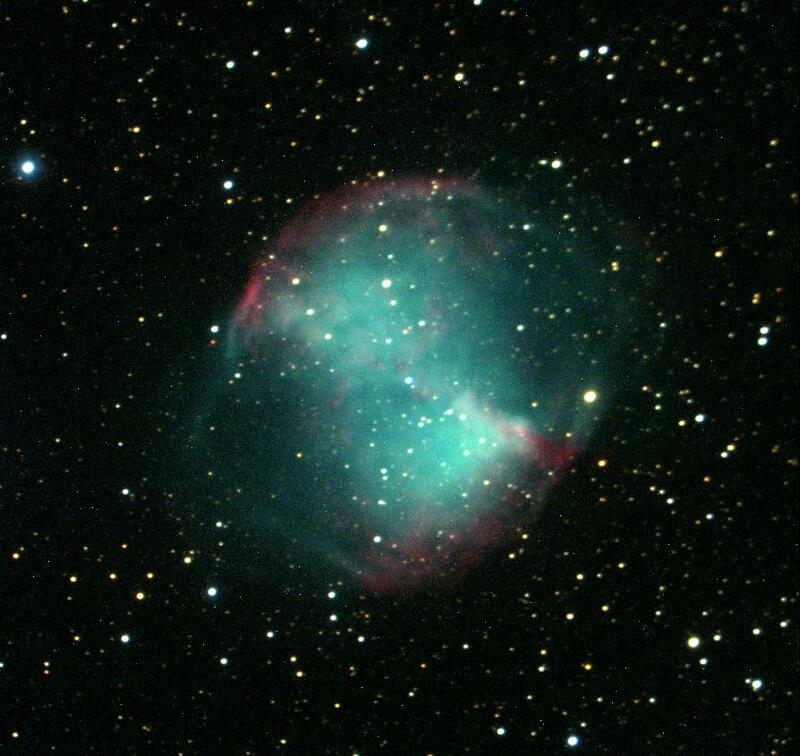 M27 is bright enough to be a distinct fuzzy spot through binoculars under dark skies. It seems to have the "barrel" symmetry of many planetary nebulae, seen in this case sideways. Note the faint arcs closing in the ends of an oval shape left vacant by the bright, visually obvious parts of the nebula. In the colliding-wind paradigm for structure of these nebulae, these faint, bulging regions represent the faster wind from the later stages of the star's evolution, which by analogy with the solar wind, might be from the star's poles. For a more colorful view, here's a 3-color BVR composite with the 0.9-meter telescope of the SARA Observatory on Kitt Peak, Arizona. The strong emission lines of oxygen partly slip though the cracks of this filter combination, so this image makes the nebula look more blue and less green than the eye sees in really dark skies. Total exposures were 10 minutes each in V and R, with 15 minutes in the blue filter.